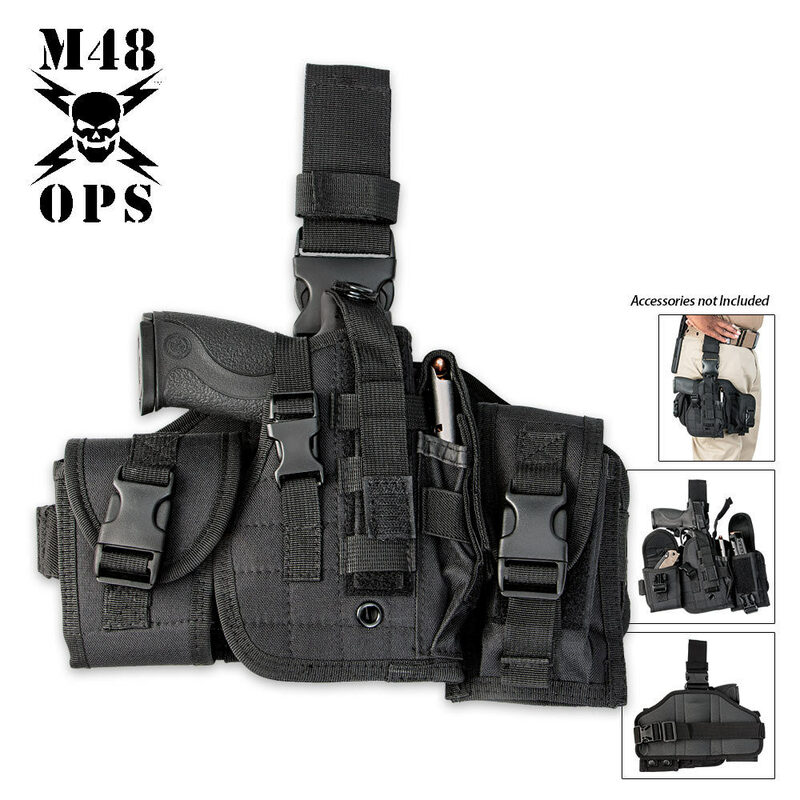 M48 OPS Assembled Drop Leg Gun Holster - Black | BUDK.com - Knives & Swords At The Lowest Prices! 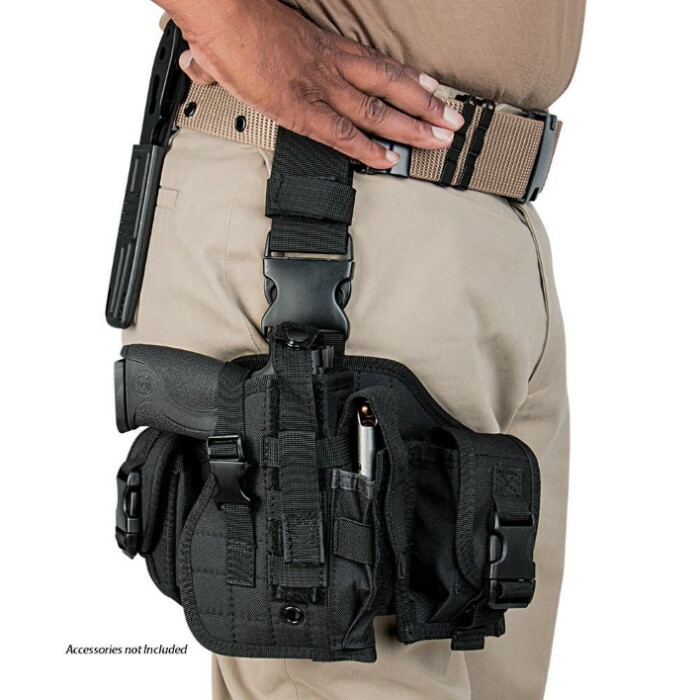 Strap this new drop leg gun holster to your leg along with all your other essential gear. 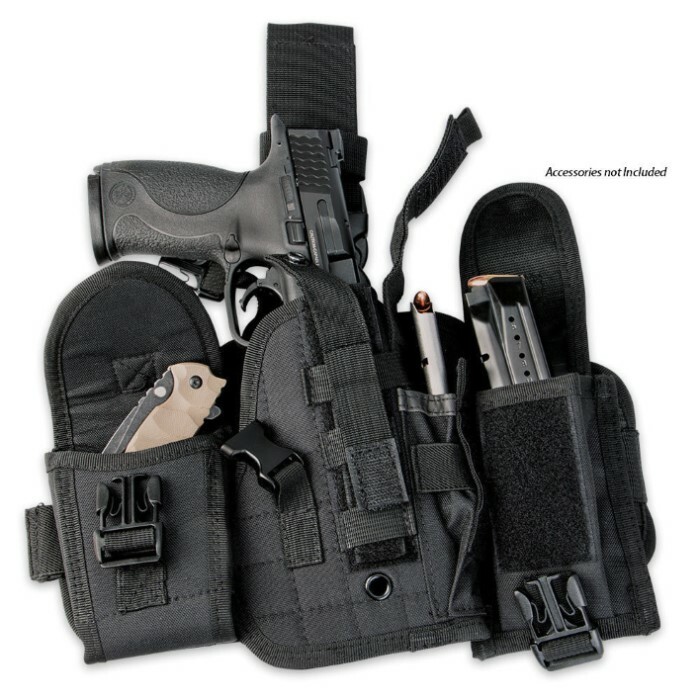 This top-quality holster pack houses most standard size pistols and has two additional pockets for ammo and other small accessories or gear. The heavy-duty nylon construction offers durability and features multiple straps and MOLLE webbing. Not sized right for my Ruger 1911 Commander, but the Bersa 9mm single stack that I bought for my wife fits fine - even with the rail mounted laser sight attached. The rig is well made and it fits a Taurus PT111 Millennium G2 with laser perfectly. I would recommend it and I may be buying another one. The holster straps were too short for my full size Px4 Storm .45 but the rest of the platform is fine. I swapped out the holster for the one on my tac vest. I bought this for my .22 s&w pistol and it fits great the strap that button the gun in wasn't long enough but its adjust with a little work and now fits great. Even can be broken down so can be carried as aside holister, all and all great buy that I would recommend to anyone that wants a great leg holister. I bought this cause I needed a holster for my .22 LR handgun it fits in the holster but I can't seem to get the straps to fasten to hold the gun in when not in uses other than its a good holster though wish made the gun straps adjustable. Great attachment. Sturdy, rugged, comfortable, but the holster itself was too small for my M1911. Longer Barrel guns do not fit so well. Other than that, great leg holster. I actually took the holster off the tactical Cross-Draw vest and replaced it with the leg holster. Works great. Overall quality is what you expect for the price. Pros: price Cons: a bit small for full framed side arms. Barely fits a 5 barrel. I would say it's perfect for 4.5 and smaller. Conclusion: not too shabby for starter drop leg holster. Best for figuring out what you like in a drop leg. Use it for a while then upgrade once you've figured out what you like and need.